You’re taking your baby on an international trip, and you’ve got all the baby travel gear you’ll need for transportation. But what about the items you’ll need to feed your baby once you get to your destination? You might be looking around your kitchen in despair, wondering how you’re going to transport all the myriad items you use for your baby. Don’t stress out! We’ve consulted with expert traveling parents to find out exactly which baby feeding items are travel must-haves, and what you can leave at home. Today we’ll cover the things you’ll need to feed your baby while you travel. A hungry baby is an unhappy baby, and you do not want an unhappy baby as a travel companion. For babies too young to eat solid food, your travel feeding gear will be pretty simple. Babies who are exclusively breastfed don’t need any special equipment at all – they just need mom! If your baby takes bottles, bring along several of the bottles your baby prefers. Fill a travel-size bottle with dish soap and bring a small bottle brush so you can clean the bottles in your hotel room. We also recommend bringing some pacifier and bottle wipes so you can do a quick clean up of bottles while you are out and about. Don’t Bring: multiple cans of formula, unless your baby takes a very special variety. The major formula brands you’re familiar with are sold in countries around the world. Similac, for example, is available in 96 countries! Save the space in your suitcase, and purchase more formula from a local grocery or drug store. You’ll need to go to the store to buy bottled water, anyway! For older babies and toddlers, you’ll want to bring a leak-proof sippy cup so you can carry water for your baby without making a mess. You probably already have a collection of sippy cups at home. For travel, choose one that is as leak-proof as possible. You’ll also want to pick one that is easy to clean, without complicated valves and straws. Our favorite is the Munchkin Miracle 360 Sippy Cup . We also think that silicone sippy cup lids are perfect for travel. You can pop these stretchy lids on to just about any glass or sturdy cup. It makes it so easy to get your baby a drink at a restaurant, without having to memorize the phrase “I’m sorry for the mess” in the local language! The silicone lids are also very easy to clean because they are just one piece. No worries about curdled milk or sticky juice lingering in the sippy cup! One of the best parts of traveling is getting to eat at lots of restaurants. But as a parent of a baby or toddler, you know it’s a bit more complicated when you have a tiny diner with you! While you certainly can hold your child in your lap while you eat, it’s a lot more relaxing to have your baby secured in her own chair. If you have room for it, a portable feeding chair that straps on to a dining chair is an awesome piece of baby travel gear. The Summer Infant Pop N’ Sit Portable Booster is the most popular option on Amazon. It folds up into a small package and also has a convenient feeding tray. Another even smaller option is a cloth harness to strap your baby into his own chair. Is baby a messy eater? 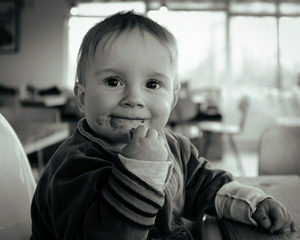 (Are any babies NOT messy eaters?) Consider picking up a napkin clip or two so you can turn any napkin, cloth, or paper towel into a quick travel bib. Don’t Bring: baby’s own bowls, plates, or cutlery. Your baby can eat using a regular teaspoon, off of a saucer or bowl provided by the restaurant. You wouldn’t take your baby to the mall without an ample supply of snacks to keep her pacified. That same theory applies when you travel with your baby! Make sure you have plenty of snacks with you when you board your flight with your baby. The best snacks for the airplane are small ones like puffs or Cheerios that you can slowly dole out, one by one, to keep your little one occupied. You should be able to replenish your supply of snacks at local groceries at your destination. However, you should definitely bring a good snack container or two. The best baby snack containers for travel are ones that allow your baby to access just a piece or two at a time, without being too easy to dump out. You’re likely familiar with the TSA’s rule that you can’t carry any liquids or gels larger than 3.4 ounces onto an airplane. But did you know the rules are different for baby food, formula, and pumped breastmilk? The food and drink your baby will need for the flight are exempt from the TSA’s limitations on liquids and gels. You are allowed to bring pureed baby food in a “reasonable quantity.” This means you can bring enough food to get your child to your destination, so don’t bring much more than you think you will need for your flight. Even if you prefer to make your own baby food, it’s a good idea to bring commercially packaged jars or pouches of baby food. You will need to pull your packages of baby food out of your carry-on bag to be screened separately. The packages may be swabbed with chemicals. Have some of those pacifier wipes on hand to clean them up before you feed them to your child. You are also allowed to bring special drinks for your baby or toddler, such as premixed formula, milk, or juice. The TSA officer may ask you to open a container so they may test a small quantity. Traveling with pumped breastmilk? You are allowed to bring ice packs or gel-filled freezer packs to keep the milk cold while you travel. If you are flying with a large quantity of breastmilk, you may want to consider freezing it solid and checking a cooler as luggage. Although there is no set limit on how much breastmilk you may bring in your carry-on bag, we have heard too many stories of mothers being forced to throw away their “liquid gold” by TSA officers who misunderstood the rules. Tell us your baby travel stories in the comments! Previous PostGo, Baby, Go! Our Picks for the Best Baby Travel GearNext PostBest Baby Travel Gear: Keep Clean and Get Some Sleep!